On August 15, ISIS attacked several positions of the Syrian Arab Army (SAA) and its allies in the southern part of the al-Taim oil field in the province of Deir Ezzor. According to pro-opposition sources, the following clashes resulted in minor casualties among the both sides but the terrorist group’s members were forced to retreat causing almost no damage to the government’s infrastructure in al-Taim. In July and August, ISIS units carried several attacks on SAA positions in the Homs-Deir Ezzor desert. According to local sources, these attacks are an attempt to draw the SAA attention from ISIS cells hiding in the desert area at the administrative borders between the provinces of al-Suwayda and Rif Damashq. The estimated manpower of the ISIS units operating in the Homs-Deir Ezzor desert, and according to some sources in the US zone of responsibility near the At-Tanf garrison, is about 1,000 members. Abu al-Fath al-Farghaly, a senior commander of Hay’at Tahrir al-Sham (formerly Jabhat al-Nusra, the Syrian branch of al-Qaeda), warned Russia’s Foreign Minister Sergey Lavrov that his group will “cut the feet” of any soldier, who would attack the so-called opposition in the province of Idlib. “The Mujahedeen are in their strongest physical and moral status and their will won’t decline for a moment until the liberation of Damascus and beyond,” al-Farghaly said in an open letter to Lavrov, according to the HTS-linked news agency Iba’a. 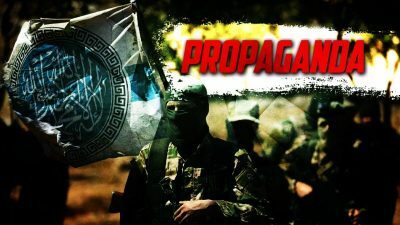 This unprecedented open letter has been described by Syrian experts as a desperate attempt to boost morale of Hayat Tahrir al-Sham and its allies ahead of a possible SAA operation in the province of Idlib. Previously, militants groups have repeatedly claimed that they would never retreat from Aleppo city, Daraa, Quneitra and other key areas. However, all of them has been liberated by the Syrian-Iranian-Russian alliance. The history is about to repeat itself once again in Idlib. Meanwhile, the SAA artillery has increased strikes on Hayat Tahrir al-Sham targets near the villages of Sarja and Umm Rajim and nearby areas in southern Idlib. Several members Hayat Tahrir al-Sham, the Turkistan Islamic Party (TIP) and Jaysh al-Izza were reportedly killed in the shelling. Artillery strikes as well as separate airstrikes by the Syrian military is aimed at destroying the militants’ defense infrastructure and weapon depots. This would help the SAA in case of a large-scale confrontation in this area. While some pro-government sources have already claimed that the Idlib advance will be launched soon, many still depends on results of the ongoing behind the scenes negotiations between Russia and Turkey on the issue. The situation is developing.